The Billabong Kitchen and recipes were inspired by the personal health issues of owner Tory, who undertook vigorous research and experimentation to bring herself back to perfect health, as well as understanding that the journey continues as we change and grow, ebb and flow. As a busy mother of twin boys and a little girl, the importance of feeling well every day is a simple expression of love towards the family and then extended into the community. When one feels vibrant we become our full expression and naturally live in the moment as joy flows more easily through us. When we are unwell those around us also suffer. The importance of organic fruit, vegetables, dairy and meats cannot be more important than today when our air, water and soils are polluted and depleted of vital components that nourish and charge our bodies with vitality. Especially magnesium, zinc, calcium, protein, phosphorous, riboflavin, vitamin c.
Although many people are starting to understand the importance of organics and avoiding the very real dangers of carcinogenic chemical sprays, irradiation, GMO’s, factory farmed chickens, and unethical and unhealthy animal farming practises, many are still choosing to shop at the big supermarkets whose monopoly on the industry forces out small business and pays very little to farmers and growers for produce. Be active, be aware, where you spend your food dollar makes a difference. We are so passionate about using food as medicine that fresh and local produce is of enormous importance. We work with a local organic farm Common2us in Dural who again work with other local farms to provide for our delicious meals. They are passionate about organics and work hard to achieve their dream of organic farming. Much of the produce is picked, delivered and then eaten on the same day! We purchase Demeter farm flours, millet, brown rice, stone-ground, wholemeal and sorghum and use a combination for all our gluten free guests. We use Australian grown biodynamic long grain brown rice and purchase pesticide free Australian grown nuts and seeds for cakes and homemade muesli. There are no refined flours or sugar on the premises. Our delicious cakes are made using local unheated honey from Arcadia. We use only Australian made cold pressed olive oils, organic coconut oil and never use vegetable oils or canola oils or spreads. Although Australian made can be a little more expensive, Australian organic regulations are more extensively monitored and regulated than overseas counterparts and of course supporting local is the only sustainable option for the future. Who will be feeding our children in the future? Educate your children on the importance of eating organic, take them to the farm so they know what one looks like. Grow a few things in the garden, its so enjoyable to watch them pull out some basil and munch on it! Any meat that we serve is from an organic butcher called Dural Poultry and meats. The owner Jack, owns the farm in Mudgee where grass fed cattle are raised as well as chickens, pigs and fowl are well looked after. A passionate and wonderful character Jack is more than helpful and willing to answer questions about the farm, for example, the animals are consistently grass fed and “not finished on grain” and the bacon is naturally smoked by hand by Jack. No nitrates or preservatives. So in keeping with our vision for the retreat we commit to serving the most nutritionally sound produce, organic and chemical free grocery items, meat, dairy and eggs. 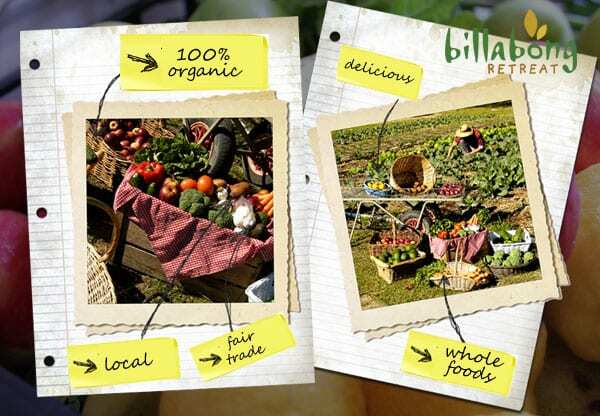 We will continue to work with the farmers through the inevitable challenges that nature brings, we will continue to be aware of and find new solutions to packaging and ensure the health of our guests is nurtured through the food that is served at the Billabong Kitchen.